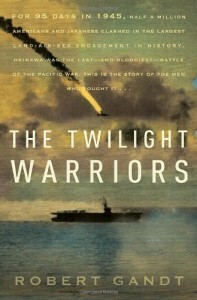 The Twilight Warriors: The Deadliest Naval Battle of World War II and the Men Who Fought It - Robert Gandt - review - "Check Six"
The last great battle of the Pacific war loomed. They didn’t know it at the time but most realized the war was coming to an end. This is a story of the Okinawa campaign. This is primarily the story of the Navy pilots of the USS Intrepid. Some were veterans of other battles and campaigns. Some were brand new pilots, who called themselves ‘Tail-end Charlies’, anxious to get into the war before it ended. Some were senior officers who had never been to combat. It is also the story of the Army and Marines who landed on Okinawa and the Japanese Navy, Air Force and Army who fought there. It is a much more complete story of the campaign than I expected. Ernie Pyle is here. Kamikazes become more than early precision-guided-weapon, you get to know who they are. The last sortie of the Yamato and the race to kill it is an exciting story. Getting plastered before deployment was a ritual in the wartime Navy, and the pilots of Bomber Fighting 10 were no exception. It was the night before their departure aboard the aircraft carrier USS Intrepid. The entire squadron had suited up in their dress blues and mustered in the club for their farewell bash. The party began like most such occasions Pronouncements were made, senior officers recognized, lost comrades toasted. The liquor flowed, and then came the singing. It was a form of therapy. For the new pilots, the booze, bravado, and macho lyrics masked their anxieties about what lay ahead. For the veterans, the singing and the camaraderie brought reassurance. Most knew in their secret hearts that they’d been lucky. They’d lived through this much of the war. There were no guarantees they’d make it through the next round. Leaning against the bar and clutching his drink, Ensign Roy “Eric” Erickson bellowed out the verses of the song. Erickson was a gangly twenty-two-year-old from Lincoln, Nebraska. He was one of the new pilots in the squadron. They called themselves “Tail End Charlies.” They flew at the tail end of formations, stood at the tail end of chow lines, and now were catching the tail end of the war. But US Navy flying is only part of the story told here. The story of the kamikaze is also told in great detail because this was the battle where they made their major impact. We also will get to know US and Japanese sailors on various ships, Ernie Pyle shows up for his rendezvous with fate, the landing and battles are covered on both sides…you get a real picture of the entire campaign here. Not as detailed as [b:Tennozan: The Battle Of Okinawa And The Atomic Bomb|1558623|Tennozan The Battle Of Okinawa And The Atomic Bomb|George Feifer|http://d.gr-assets.com/books/1189310913s/1558623.jpg|1551127] will give you but this book would be a great place to get excited about learning more. Hilarious description of the gulf between the surface Navy men (black shoe) and the Navy pilots (Brown shoes). After the first day of combat in the Okinawa air campaign, the flyboys gather to relive the day’s events while the regular Navy looks on. Jabbering at the opposite end of the room were the brown shoes, gesturing with their hands, rehashing the action over Kyushu and Shikoku. Most had flown two combat missions that day. Images of flak bursts and targets viewed through gun sights and the dry-mouthed anxiety of nearly empty fuel tanks were still fresh in their minds. Even in normal times, the two groups maintained a cordial distance. Black shoes made no secret of their belief that they were the only real Navy men aboard the ship. They alone understood the crafts of ship handling, gunnery, navigation, damage control. Without them, the carrier was nothing more than an immobile barge. But what galled the black-shoe officers most about the airedales was their attitude. They were like spoiled frat boys. They sequestered themselves in their private berthing spaces, where they played cards, partied, and, if reports were to be believed, actually consumed booze. One of Intrepid’s black shoes came up with an analogy: the brown shoes were just like seagulls. Except for flying, all they did was eat, sleep, and crap. . The drama of the final sortie of the Yamato and her escorts is superb, told from the perspectives of all the participants. Really well done. The war in the Pacific had a completely different experience from the European theater. The aftermath of the sinking of the Yamato shows this clearly. The Yamato might be gone, but the enemy was still there. The sprawling oil slick served as a marker on the ocean for where the ship had sunk—and where her surviving crewmen were floating. The warplanes came swooping back down, one after the other, leaving long white tracks of .50-caliber machine gun fire spurting across the water. For twenty minutes they raked the survivors of the Yamato and Yahagi and the sunken destroyers. Ducking bullets, watching the heads of their comrades splattering like melons, the swimmers felt a mixture of terror and hatred. It was not a surprise that the enemy would shoot them in the water. Given the chance, they would do the same. For some, the hail of bullets had an energizing effect. Hating the Americans gave them the spark to stay alive. At 1131 on May 4, a Zero wound its way through the British CAP fighters and the antiaircraft barrage and crashed into the flight deck of the carrier HMS Formidable. There was a fireball, a number of casualties, and damage to parked airplanes and deck equipment. The kamikaze had splattered on Formidable’s armored flight deck like a scrambled egg. And that was it. No raging fires or cataclysmic explosions. The carrier shrugged off the hit and continued operating. The incident revealed a crucial design difference between British and American aircraft carriers. All the U.S. flattops, including the newest Essex-class fast carriers such as Intrepid, had wooden flight decks. With deadly frequency kamikazes were punching through the wooden decks like knives through cardboard, exploding into the packed hangar bays. The wooden decks were a carryover from 1930s aircraft carrier design. Wood could be more easily repaired than steel and, in theory, the lighter wooden decks allowed the ships to carry more airplanes. No one had foreseen the specter of suicide planes crashing through the wooden planking. Now U.S. carrier skippers, watching the kamikazes ricochet off the British steel decks, were already thinking about the future. Postwar U.S. Navy aircraft carriers would not have wooden decks.